An oversized knit is a style staple for winter, not to mention how snug and comfortable they are. Feminine, stylist and so versatile, editor Trudi Brewer reveals this season's best sellers. Over-sized sweaters were made to wear with skinny jeans - but we challenge you to push your style and consider wearing a chunky knit with man-style pants and brogues, leather leggings and sneakers or a hip-hugging calf-length skirt with heels. Here's our pick of stylish sweaters. Twist and shout sweater, $329, from Trelise Copper. Second row: Balance sweater in hunter green, $387 from Taylor. Everyone's favourite sweater, $389 from Standard Issue. 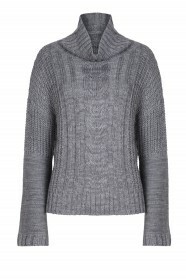 Ample sweater in charcoal, $300 from Moochi. Style tips: A sweater and scarf combo is so elegant, we love a pretty pastel or patterned cashmere scarf teamed with a grey or black bulky knit. Our favourite look and one that gives the most structure is layering a long line sweater with a coat or blazer over the top. For the office team an over-sized sweater with a crisp white collared shirt, fitted man-style pants and heels.